Our son Justin is on the set of Pretty little Liars. He totally fits with their look. This isn't the half of it. Of course the dining facilities can not be matched. I am so proud of him. 5 Reasons Why It's Better to Own a Home Than Rent Right Now. This video covers 5 reasons why it's better to own rather than rent real estate right now. The reasons are compelling. There are many people who claim home ownership may not be the best investment idea. This opinion was shared by Time magazine who also said, a couple of years ago, homeownership WAS the best idea. There is so much "noise" in the media about whether or not to own a home in this market: will the value go up or down, should I buy or not? Let's try to quiet the noise and interrogate reality to help make a wise desision. The first thing to examine is real estate as an investment. Real estate value rises slowly over a long period of time. To pull this idea out of context and examine it under the lens of an asset with a "quick sell, high profit" approach is unrealistic. Let's look at past history to make logical decisions: Louisville real estate's highest value is in the long term. Louisville real estate, as a whole, holds its value extremely well. 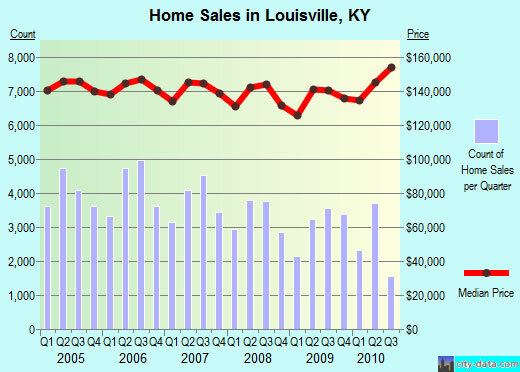 The median home price of Louisville real estate over the last few years of so called "distressed Louisville real estate market" remained relatively stable. If we choose to rent, we still choose to pay a mortgage. We just choose to pay our landlords mortgage and not our own. This is compelling. As the This creates evalue of the property rises, however slowly it may do so, the amount owed decreases, thereby creating equity. This equity is wealth to the property owner. Wealth goes to you or your landlord. You choose. The interest on your monthly mortgage payment is tax deductable. If you rent, your landlord gets the deduction. If you own the home, YOU get it. You are making the monthly payment either way. It is in your interest to get the tax deduction. One last point: rent goes up every year. A 30 year fixed mortgage stays the same for that 30 year period. Also, you don't have to ask your landlord permission every time you want to make a change to the property. Hopefully, we've offered 5 good reasons why owning a home in Louisville makes much more sense than renting. If you have any other questions, please don't hesitate giving us a call at (502) 371-1173. We are here to answer any questions you have about Louisville real estate.